Premium Quality Compatible Bernina Walking foot for the NEW style Sewing machines. 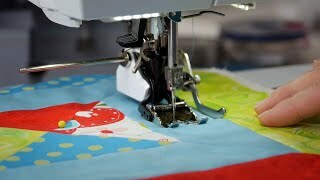 Use the "quilting sole" when machine quilting. The new quilting sole has an "open Toe" configuration to improve visibility when Quilting. It also provides 1/4" and 1/8" markings to serve as seam and cornering guides. The back of the quilting sole is designed to reduce drag on the quilt, further promoting perfect feed.